Most Digital Command Control (DCC) decoders presently on the market are capable of use on analog (direct current) layouts as well as digital, without any physical switches or additional input from the operator. While that feature is beneficial because you can take an engine from a layout using one operating system to another layout using the other operating system, there are occasionally problems that can occur with analog-capable DCC decoders. 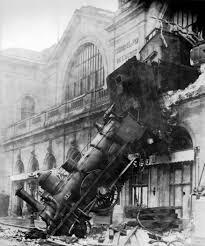 The most commonly-encountered issues with analog-capable DCC decoders is the dreaded runaway locomotive. Another far-less-common issue is with some layouts (including our home layout at the Beaverton Modular Railroad Club) that use a large-scale, eg- O-scale or G-scale, decoder to provide direct current to the track, effectively mimicking an analog controller. I will provide a broad overview of each condition and how to remedy them, beginning with runaway engine. A runaway engine is a relatively rare occurrence that will happen when an operator has his or her engine placed on the track before the Digital Command Control system is turned on, and once the layout is powered-up, the engine unexpectedly accelerates to full speed without any input from the throttle and irrespective of throttle-speed position (ie- even with the speed set to zero.) In this uncontrolled condition the engine will usually not respond to the Emergency Stop button, so the operator must interrupt track power by turning off the DCC system. A runaway engine can be a frightening and potentially dangerous situation should the engine strike and damage other equipment, but thankfully there is an easy way to prevent it from happening again. Before walking you through how to prevent runaways, it should be explained why the condition exists in the first place. Ordinarily when a DCC system is powered-up, the command station’s ‘brain’ sends an electrical signal to the track, quickly followed by full track power, usually around 12 volts. The signal essentially tells all decoder-equipped locomotives on the track, “Hey engines, you’re on a digital track, so when I apply the full track voltage in a moment, ignore it and await further commands.” Normally the decoder dutifully complies with the command and will sit patiently on the track. Rarely does this system malfunction, but when it does, either the command station fails to send the electrical signal, or for whatever reason the decoder does not receive or recognize the signal. Then, when the command station applies the full track voltage, the decoder mistakes it as analog voltage and responds by accelerating the locomotive to full speed- a runaway engine. Since the confused decoder thinks it’s running on analog, it will ignore the Emergency Stop button and will only stop when system power is removed. The easiest way to prevent this happening is to turn off the analog function of your digital decoder. To turn off the analog (direct current) capability of your decoder, you must first program it by changing one configuration variable (CV.) In most, but certainly not all (Lenz and ESU being noteworthy exceptions,) modern NMRA-compliant decoders (Digitrax, Soundtraxx, Train Control Systems, and North Coast Engineering,) direct current is controlled by bit #2, which has a numerical value of 4, within CV29. So in simple terms, you must subtract a value of 4 from whatever number is already in CV29. The easiest way of doing this is by placing your engine on the Programming Track, calling up your engine’s number, accessing CV29 and then programming the same CV to the desired value. For instance, let’s say you get a reading of CV29=38, you would program CV29 to a value of 34. *If your loco address is between 1 and 127 (including the default address of 3,) your CV29 probably has a default value of 6, so to turn off DC, program CV29 to 2. *If your loco address is between 128 and 9999, your CV29 is probably the value of 38. So to turn off DC, program CV29 to 34. Note: If your loco has had the Normal Direction of Travel (NDoT) reversed, ie- running long-hood forward in a diesel engine, add a value of 1 to CV29. In the first example for instance, if it was an engine with the long-hood forward, with an address between 1 and 127, the default of CV29 would have been 7, so to turn off DC the value would be changed to 3. In the second example, for a long-hood-forward engine with an address 128 or higher, CV29 would have been 39, so the value would have been changed to 35. Some older decoders, non-NMRA-compliant decoders, Lenz, and ESU decoders’ CVs vary from model-to-model, so to turn off direct current on those decoders, please refer to their product manuals, which are easily obtained free-of-charge online through the manufacturers’ websites. Another situation in which you may wish to turn off the analog function of your decoder is when your layout uses a large-scale decoder to provide analog power to the layout’s tracks. As an example, our club’s home layout uses O-scale decoders connected directly to the command station, and the output (motor) wires from the decoder are wired directly to the tracks. Since there is a decoder providing power to the tracks, the power isn’t ‘pure’ direct current, by which a typical analog-only engine won’t be bothered and will run just fine. However, when one attempts to run a DCC-equipped locomotive as an analog loco on those same tracks, it results in jerky operation at best, and a great buildup of potentially-damaging heat in the decoder and motor at worst. In a nutshell, you can’t use a decoder to run another decoder. Therefore at our layout we recommend that if a loco has a decoder, it must be run on DCC only, and analog-only locos be run using our version of direct current.